You can check the list to see overdevelopment applications in your neighbourhood/street. If you would like some help objecting to overdevelopments contact DADA. Darebin Appropriate Development Association (DADA) is a group of residents of Darebin concerned with inappropriate development in Darebin. 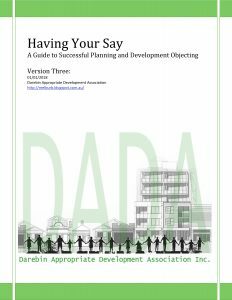 Darebin Appropriate Development Association (DADA) invites feedback, complaints and opinions from residents concerned with inappropriate development in Darebin.